Skin Pigmentation (White Patches) can be caused by lack of production of melanin, hormonal problem, anemia or lower HB level, vitamin B 12 deficiency, hereditary factors, over sun exposure, dirty environment, stress, worms, deep acne scars and dark patches start appearing on certain parts of the skin gradually spreads throughout the body and even hair that grows on the infected area. 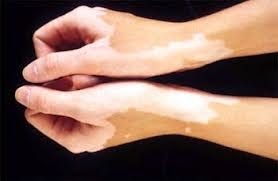 These white patches also called as Leucoderma or Vitiligo and a sign of health problems in the body. In serious conditions you must consult a dermatologist or skin specialist to treat this problem but from the early stage you can cure it with some useful natural tips and remedies. Make a powder with 100 grams black cardamom; dried mint leaves 100 grams and 100 grams Nigella seeds. Daily take ½ teaspoon with the water contained in copper vessel for overnight. Use it contentiously for 2-3 months for required results. Take ½ teaspoon Turmeric powder with water 2 times during the day. Also apply a paste of Turmeric powder on affected area for 2-3 months. The best effective remedy to Pigmentation (Phulbari) naturally. Mix Egg Yolk oil in Flax seeds powder to make a paste. Apply this paste on affected area 2-3 times during the day for 2 months. Grind Fresh Potatoes Peel off and mix Turmeric powder in it and apply it on the patches for 20-25minutes. Keep rubbing smoothly with your finger on affected area. Continues use for 2-3 months will help you to get rid from this problem. Apply fresh Ginger juice daily on your patches it improves blood flow to the affected area and help to treat white patches naturally. Mix Nigella (Kolonji) seeds oil in oat meal powder and make a smooth paste apply it on affected area for 25-30 minutes daily till the required results. The best tip for skin pigmentation. Mix Almond oil in Sandalwood powder and add a little amount of turmeric powder in it. Apply this paste on patches and leave it to dry for 25-30 minutes. Keep smooth rubbing during this time. Wash with normal water. Raw or Green Walnut paste application on white patches is one of the fast and most effective natural tips to treat skin pigmentation. Make a paste with Mint and Neem Leaves. Mix Aloe Vera gel in this paste and apply it on affected area. Leave it to dry than wash with normal water. Dry pomegranate peels and make a fine powder with it. Mix nigella seeds oil in it and keep it in a glass jar. Daily apply 2-3 times on affected area for 1 month and see the results. 1)Increase Copper consumption level which help in production of melanin. 2)Keep away yourself from stress. 3)Avoid to use salt right from today. 4)Avoid using harsh chemical soaps while bathing. Add Neem leaves water while bathing in your tub. 5)Keep your skin dry and wear thin, loose clothing. 6)Avoid consumption of citrus foods and juices. 7)Use a sunscreen when you are going out. 8)Boil some cabbage leaves in water and use the water to wash the affected skin area. Add 1 teaspoon honey in 1 glass of water and drink it daily.